Stay at Arogyalayam, Learn & Practice a holistic “Natural Lifestyle”, Get Health Benefits! This Arogyalayam is the biggest Nature Cure Hospital in India (600 beds). Nature Cure means, being healthy and curing ailments without any medicine, by leading a balanced lifestyle in line with Nature’s principles. The essence of Manthena’s Naturopathic Lifestyle can be briefly summarized in “7 To Heaven”, as below, Our Residential Health Camp is a structured way for you to understand, train & practice this lifestyle & experience health benefits. Treatment is DRUGLESS, through lifestyle modification and root cause rectification. Hence, there is NO SIDE EFFECT. In this approach, ONE SOLUTION can ADDRESS MULTIPLE AILMENTS. For instance, when diabetes is treated in this manner, person gets cured from other existing diseases like high blood pressure, asthma, joint pains, constipation, cholesterol, PCOD, harmonal imbalance, etc also simultaneously. Over 30 days, many people who suffered with DIABETES have STOPPED taking insulin / tablets, started eating all fruits including Mangoes. They gain the confidence and knowledge on how to stay away from diabetes for their life time. Click here for Testimonials from people. ♦ Lectures & Training Sessions – Creating health awareness, Training on Yoga (includes 4 customised therapeutic yoga sessions), Training on Salt & Oil free cooking. 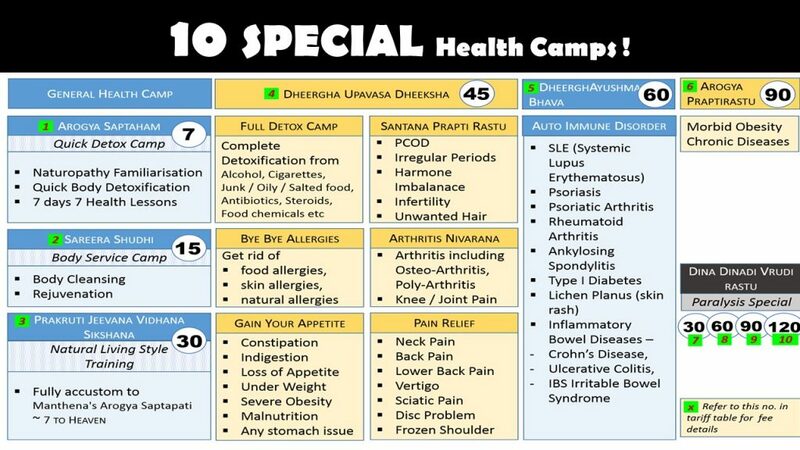 Arogyalayam offers 15/30 day Health Camps and a separate 1-week Training program. 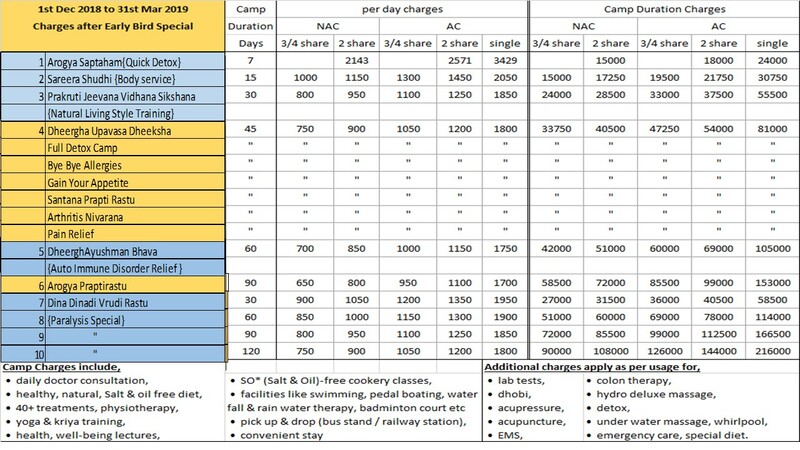 15 days Health Camp: A minimum duration of 15 days is strongly prescribed to personally experience health improvements. Over 15 days, a person gradually adjusts to the environment, cleanses the body with fasting, experiences salt & oil free food while undergoing relevant Naturopathy Treatments. Lectures & training sessions cover various topics in an orderly structured manner over 15 days, starting every 1st and 16th of a month.
. maintain good health. Longer duration fasting helps in complete body cleansing.
. 30 hours+ lectures of Dr. Raju with Q&A sessions, creates immense awareness on health.
. A person can get fully accustomed to various varieties of Salt & Oil free food. Who can join & When? 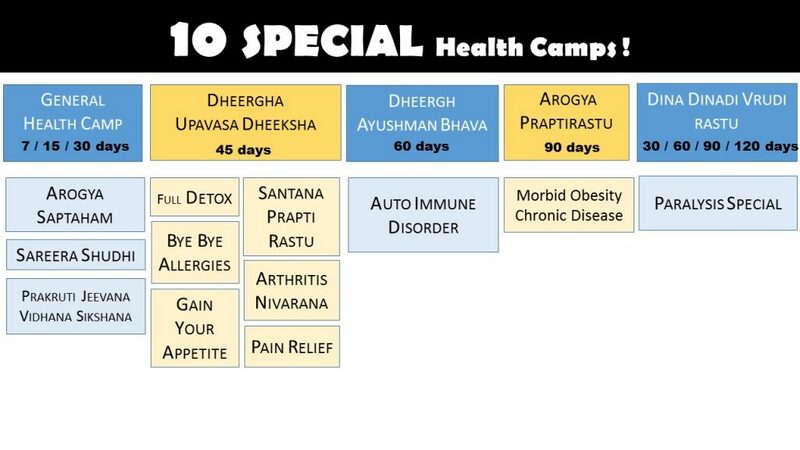 People with any ailment can join and benefit from these camps. Doctor consultation happens separately and hence addresses the individual needs of a person in full. Click for list of ailments treated. Prevention is better than cure. Hence, people without any ailments can join a health camp to understand and maintain a more healthy life. 15 / 30 days Health Camp starts on 1st & 16th of every month. People can join on any day, however, the sessions would be experienced in different order. Click for Tariff details & booking. 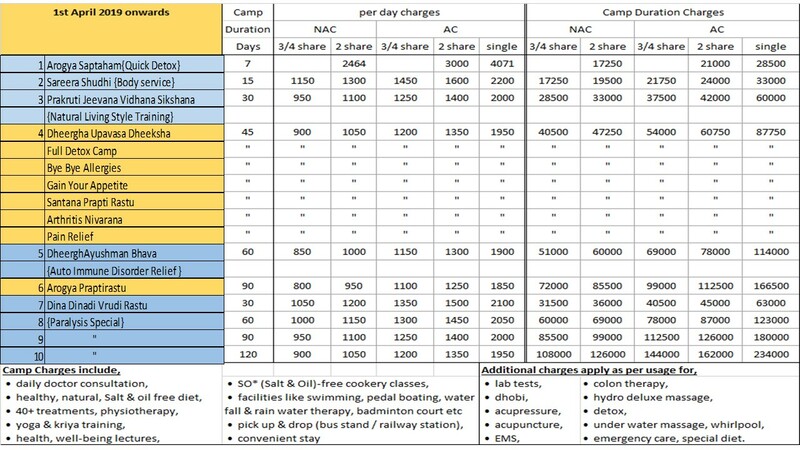 ♦ 7 different diet plans for 7 days, along with Naturopathy treatments & yoga training.
. regular sessions & lectures.
. 1st Monday & 3rd Monday of every month. Click here for Tariff details & booking. For booking or enquiry call at 0863 – 2 333 888 or click here.